In the third week of the 2011 NFL season, the Buffalo Bills hosted the New England Patriots on September 25, a team that had dominated both them and their division for most of the preceding decade. The Bills had lost to New England 15 straight times and in 20 of their last 21 meetings dating back to 2000 – the season after Buffalo last reached the playoffs. 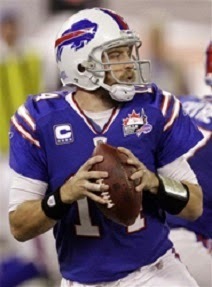 However, the Bills were off to a 2-0 start and seemed to be a rejuvenated club. The offense was balanced and effective, with QB Ryan Fitzpatrick (pictured at right) passing efficiently out of a spread formation and RB Fred Jackson productive on the ground. The defense was opportunistic and forced turnovers. Head Coach Chan Gailey’s team was coming off an exciting come-from-behind win the previous week against the Raiders and was riding high with the tough Patriots coming to town. New England, under Head Coach Bill Belichick, had not had a losing season since that long-ago 2000 season and had been in the playoffs in 10 of the previous 12 years that included four AFC Championships and three NFL titles. QB Tom Brady, at age 34, was a picture of precision as was his favorite target, WR Wes Welker. However, the defense was not as strong as in the Super Bowl-winning years. Still, they were also 2-0, with a 10-game regular season winning streak on the line, and would provide a formidable test for Buffalo. There were 68,174 fans on hand at Ralph Wilson Stadium. The Patriots took the opening kickoff and drove 84 yards in nine plays. The highlight was a pass from Tom Brady to Wes Welker that picked up 22 yards to the Buffalo 22. Four plays later, Brady again connected with Welker for a 14-yard touchdown. On the first play following the ensuing kickoff, Buffalo’s Ryan Fitzpatrick threw to WR Steve Johnson for a 33-yard gain but on the next play he was picked off by CB Kyle Arrington. New England made the most of the turnover, going 30 yards in six plays. Brady tossed a pass to TE Rob Gronkowski in the end zone for a one-yard TD. The Bills put together a long drive to the New England 35, converting two third downs along the way. But facing a fourth-and-14 situation, Fitzpatrick’s pass was intercepted once again by Arrington. The first quarter ended with the Patriots ahead by 14-0. The teams traded punts until midway through the second quarter when Brady connected with Gronkowski on passes that covered 21 and then 26 yards for a touchdown. Now down by 21-0, the Bills responded with a seven-play, 81-yard series. Fitzpatrick completed four passes and had a 14-yard run and Fred Jackson (pictured below) had a 21-yard carry. The last pass completion was to Johnson for 11 yards and a TD that, followed by Rian Lindell’s extra point, cut the New England lead to 21-7. It seemed as though the Patriots would drive to another score when they methodically advanced to the Buffalo 13, but Brady threw a short pass that was intercepted by SS Bryan Scott. Taking over at their own 10 with just over a minute left in the half, the Bills moved down the field with Fitzpatrick passing on every play. They reached the New England 24 from where Lindell kicked a 42-yard field goal to make the score 21-10 at the intermission. Following a short series by the Bills to start the third quarter, Brady threw a long pass that was intercepted by CB Leodis McKelvin and returned 21 yards to the New England 39. Buffalo made the most of the break as Fitzpatrick capped the resulting seven-play series with a three-yard touchdown pass to TE Scott Chandler. Lindell’s PAT narrowed the visiting team’s lead to four points. However, the Patriots responded with a 10-play, 83-yard scoring drive. Brady completed five passes along the way, including one to WR Chad Ochocinco for 19 yards and another to Gronkowski for 29 yards to the Buffalo 13. Gostkowski kicked a 23-yard field goal to make it 24-17, which was the tally as the game entered the fourth quarter. The Patriots again penetrated deep into Buffalo territory but Brady was again picked off, this time by FS George Wilson at his own two yard line. A roughing-the-passer penalty moved the ball out to the 20 and then Fitzgerald went long to WR Donald Jones for a 48-yard gain. It seemed for naught when Fitzpatrick fired a pass toward the end zone that was intercepted, but a pass interference penalty on the Patriots instead put the ball on the one yard line. From there, Jackson punched over for a TD and Lindell kicked the extra point that tied the score at 24-24. On the first play following the ensuing kickoff the Bills took the lead when CB Drayton Florence picked off another Brady pass that was tipped at the line and returned it 27 yards for a touchdown. Lindell added the PAT that made it a seven-point margin for the home team. There was still plenty of time and the Patriots responded with a long drive that went 74 yards in 15 plays. Along the way they converted a fourth-and-four situation on a five-yard completion from Brady to Welker and, shortly thereafter facing third-and-seven at the Buffalo 33, it was Welker making a franchise-record 14th catch for 20 yards. Finally, in a fourth-and-goal situation, Brady tossed a six-yard TD pass to Welker. Gostkowski kicked the all-important extra point and the game was again tied at 31-31. Buffalo took over with 3:25 remaining in regulation. Fitzpatrick connected with Jones for 29 yards and then Fred Jackson for 12 to get down to the New England 39. A slant pass to Jackson appeared initially to be good for a touchdown when he dove toward the end zone while being tackled from behind, but upon review it was determined that the running back had not broken the plane of the goal line and it was instead a 38-yard gain to the one yard line. From there the Bills backed themselves up by kneeling to run the clock down. On the game’s last play, Lindell kicked a 28-yard field goal that brought wild cheering from the home crowd. Buffalo was the winner by a final score of 34-31. The Patriots outgained Buffalo (495 yards to 448) and had more first downs (30 to 24). However, they also gave up four turnovers, all on interceptions, to two by the Bills. Neither team recorded a sack. Ryan Fitzpatrick completed 27 of 40 passes for 369 yards with two touchdowns as well as two interceptions. 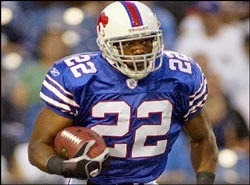 Fred Jackson rushed for 74 yards and a TD on 12 carries and also caught 5 passes for 87 yards. Steve Johnson had 8 pass receptions for 94 yards and a score while Donald Jones compiled 101 yards on his 5 catches. For the Patriots, Tom Brady was successful on 30 of 45 throws for 387 yards and four TDs but also gave up the four interceptions, tying his career worst. Wes Welker (pictured below) ended up with a team record 16 catches for 217 yards and two touchdowns and Rob Gronkowski added 7 receptions for 109 yards and two more scores. RB Stevan Ridley led the running game with 42 yards on 6 attempts. Buffalo’s run ended the next week with a loss at Cincinnati, and while they won two of their next three games, the bottom fell out after that. Injuries, in particular to Fred Jackson, wore the Bills down and they ended up with a 6-10 record at the bottom of the AFC East. New England, on the other hand, went on to a 13-3 record that was the best in the conference as well as the division. The Patriots finished off the regular season with a 49-21 win over the Bills. After advancing to the Super Bowl, New England lost to the Giants. Ryan Fitzpatrick’s passing cooled off along with the weather during the second half of the season and he ended up with 3832 yards and 24 touchdowns, but also a league-leading 23 interceptions. Playing in just 10 games before suffering a broken leg, Fred Jackson rushed for 934 yards with a 5.5-yard average gain and had 442 yards on 39 pass receptions. Steve Johnson led the receiving corps with 76 catches for 1004 yards (13.2 avg.) and seven TDs. In a year of record-shattering passing performances, Tom Brady threw for 5235 yards and 39 touchdowns, as opposed to 12 interceptions, with an AFC-leading 105.6 rating. He was chosen to the Pro Bowl for the seventh time. Wes Welker led the NFL with 122 pass receptions, for a conference-leading 1569 yards and 9 touchdowns, while Rob Gronkowski topped the league with 17 scoring catches.